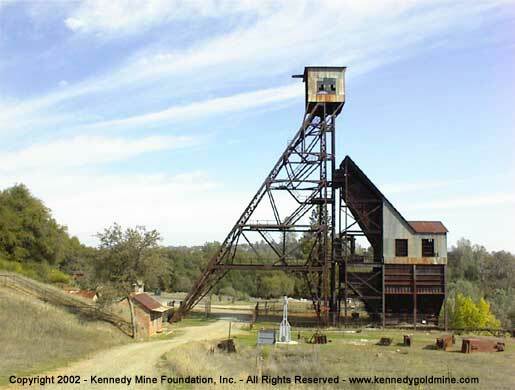 The Kennedy Mine, famous for being one of the deepest gold mines in the world (at 5912 feet), demonstrates how gold changed an entire way of life in California. Although gold was known to be present and was mined by the Spanish and Mexicans, the California Gold Rush did not begin until after James Marshall's discovery of gold at Sutter's Mill in 1848. Between 1848 and 1858, California exploded from being a largely unpopulated agrarian state into a vital, fast growing and exciting part of the United States. 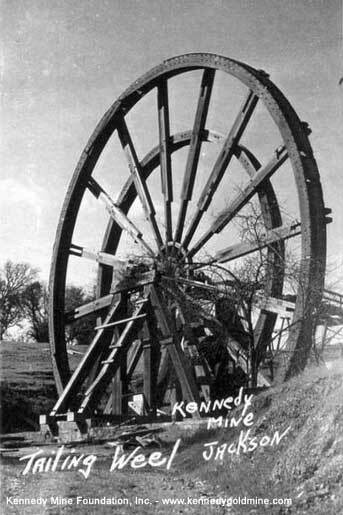 Prospected in 1860, reorganized in 1886 and continuously run until 1942, the Kennedy Gold Mine produced approximately $34,280,000 in gold according to the CA Dept. of Conservation. 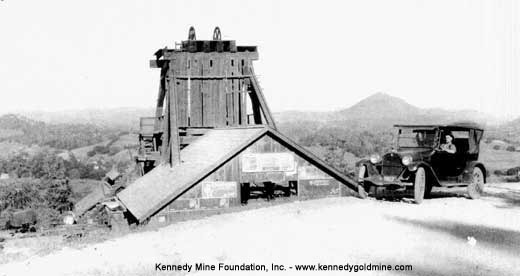 One of the tallest head frames in existence today can be seen at the Kennedy Mine. 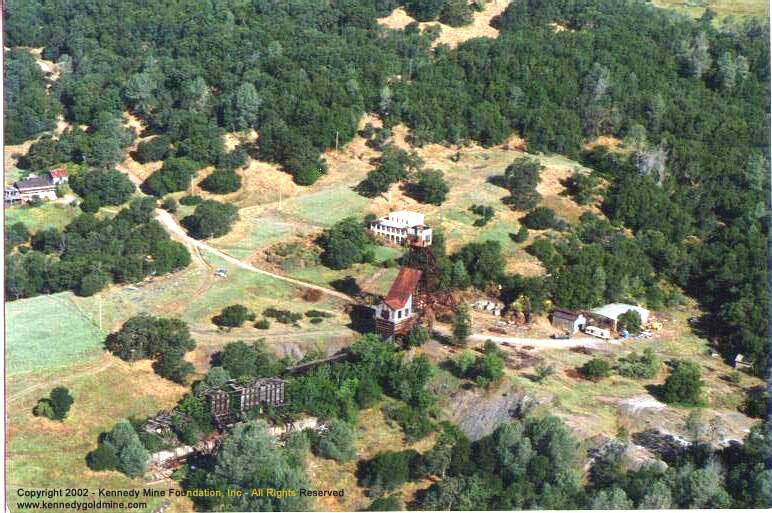 The mine also had one of the largest stamp mills in the Mother Lode, moving tailings by means of huge wooden wheels, some of which are still standing. Teachers, Educators: We have a special tour designed for your students. 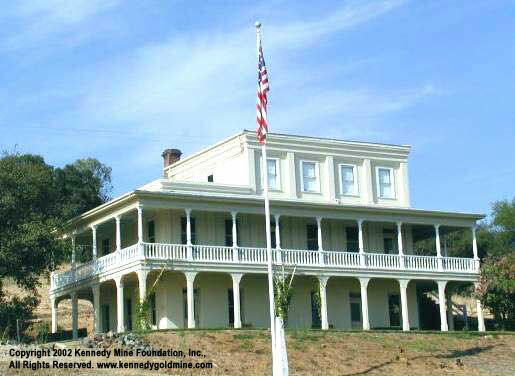 On the Kennedy Gold Mine surface tour, visitors see the mine office building where gold flakes were melted into large bricks to ship by Wells Fargo to San Francisco. This is also where ore samples were processed to see if a particular underground area was worthy of further investigation. 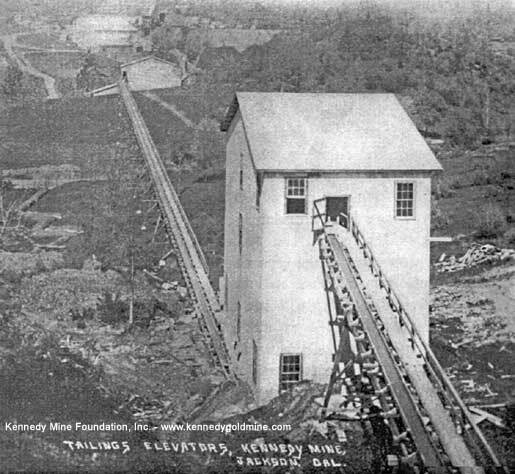 See the stamp and gold recovery mill, tailing wheels, a steam boiler and the huge steel head frame whose pulleys guided the miners into the bowels of the earth. You will also see the building where the men changed into their mining garb before dropping nearly a mile underground to work. You will view a historic video of the men working circa 1914, and much more. 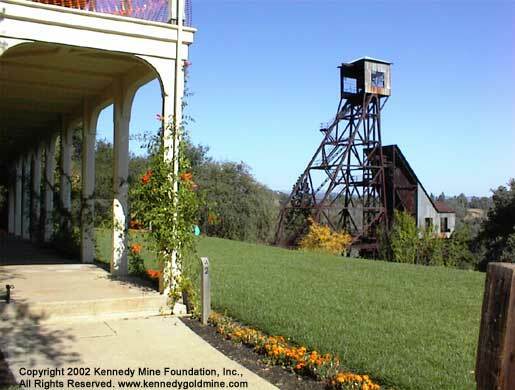 Visit the Kennedy Gold Mine and gain new insight into the complications and hardships of the miner's way of life. 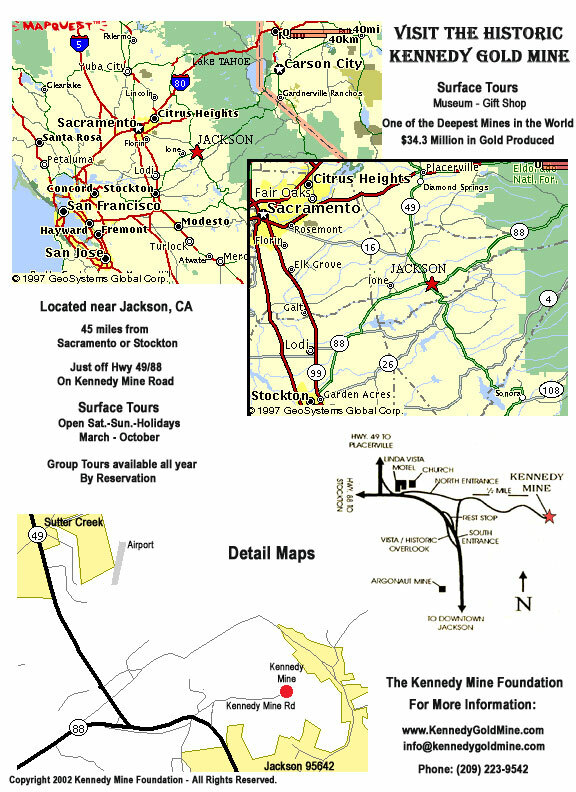 The Kennedy Gold Mine Gift Shop offers a wonderful variety of gold related items from Kennedy T-shirts and memorabilia, to a good selection of books about gold mining including a self-guided tour of the mine. You may also purchase our famous and fascinating 7 minute video seen on the tour, showing rare and unique footage of the mine in action. Virtually FLY Over the Kennedy Mine! Experience the Kennedy in a dramatic aerial view. Warning: turn your sound down, or off for an office setting. Copyright 2016 by Grant Olin of G.L.O. films, All Rights Reserved.